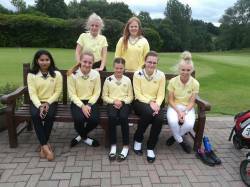 Staffordshire County Junior Girls travelled to Leek Golf Club to play against Cheshire Junior Girls on Saturday 16th June. Unfortunately, the Staffordshire Juniors lost by 6 matches to 2, but really enjoyed their day at Leek. Janet Clark, the Staffordshire County Representative said ' Although the girls lost the match, they really enjoyed playing on a challenging course, with beautiful views and scenery. We look forward to coming back again to Leek'. In 2020, two junior girls' events will be held at Leek GC. In April, the individual County championships will be played, and in August, Leek will be the home of the Midlands and North Regional Finals. More news on those two major competitions will be posted later.